A few of our readers have been asking about our daily routine. Despite posts about our adventures, we don’t necessarily go into the more mundane details. We typically wake up between 5:30 and 6 am. One of us prepares breakfast: boiling water for coffee and the muesli that we supplement with nuts, condensed, non-sweetened milk and fruits. The other one folds up the tent and cleans up the camp site. We then start biking, stopping rather frequently for pee breaks. Recumbent bikes do have a slight drawback – with its sitting position, we are more likely to want to pee. We take our first break around 10:30am for a quick snack. We then continue until 12-1pm for lunch. We try to bike at least 40-50 kms before lunch. We continue biking in the afternoon, taking a break around 4-5pm. Often, we’re looking for a grocery store or a WiFi spot. We usually ask a local store or a Mc Donald for a free WiFi hookup, as well as a possible plug. Unlike in France, it’s not obligatory to be a customer in order to enjoy the WiFi – even in cafes. An internet break usually takes us a good hour to update the blog. Around 5-6pm, we need to find water for the evening. We have 2 bottles of 1.25 l and 2 1liter pouches. With our cycling water bottles, it comes out to about 7 liters of water. That’s quite a bit and we usually only use about half of that. It however comes in handy if we were unable to find water at our next stop. To find a place to camp, other than a few exceptions, we haven’t really solicited the locals that much. With off-road camping, we have the advantage to camp whenever we wish, be undisturbed and go to sleep whenever we wish (usually around 9-10pm) At someone’s house, we have beautiful encounters and more comfort but we are not “at home”. So we enjoy alternating between the 2 different types of lodging. Just like in the morning, we divide the chores in the evening as well – one cooks and the other sets up the tent and campsite. Dinner is usually composed of a starch (rice, pasta or mashed potatoes) and a protein. For the blog, Alex writes an article in the evening if it’s not too late, or during the day – which obligates us to stop. In the Netherlands we bought a SIM’s card with 3G capabilities that allowed us to update the blog whenever we wanted. But it would simply be too expensive in the countries we cross in only a few days. We will thus have to wait until Norway before buying another plan. C’est un système basique utilisé pour tout type de vélo. Cela lui permet de garder ses chaussures normales mais d’avoir une bonne sécurité et de pouvoir « tirer » sur les pédales. Cela soulage les genoux. It’s a basic system used for most bike types. 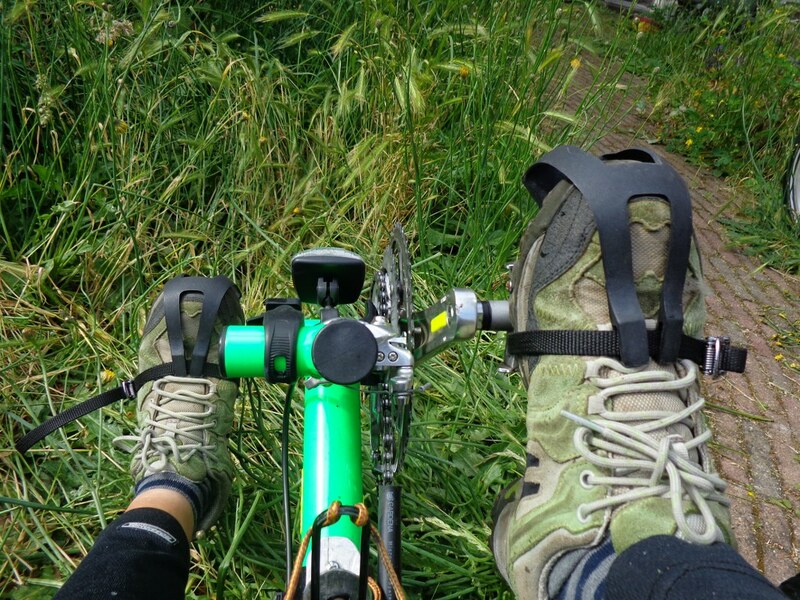 She’s able to keep her normal shoes but still have a secured foot and to be able to « pull » on the pedals. It’s much easier on the knees. Ce n’est pas aussi sécurisant que les pédales à clips, mais le pied ne glisse pas, cela reste efficace. Voilà notre quotidien en quelques mots! 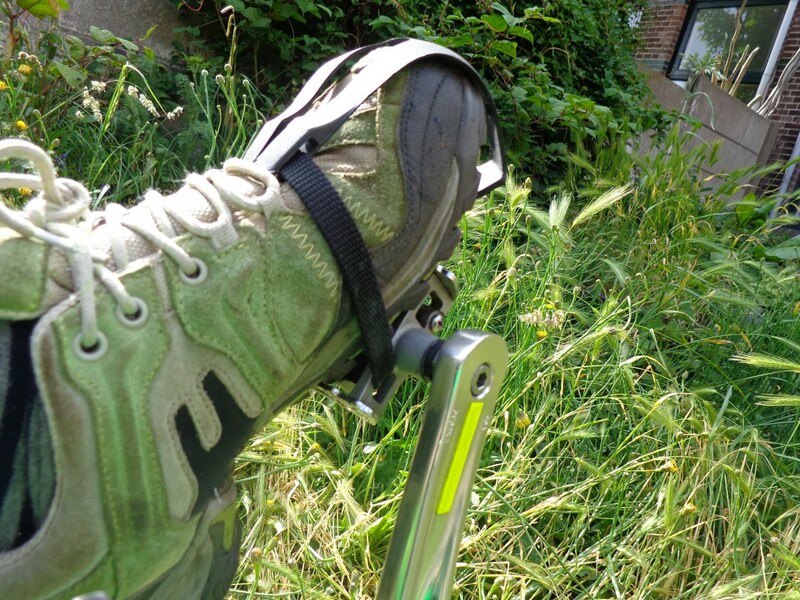 It’s not as secure as clips on pedals but at least the foot doesn’t slip off and it’s still quite efficient. That’s our routine in a few words!